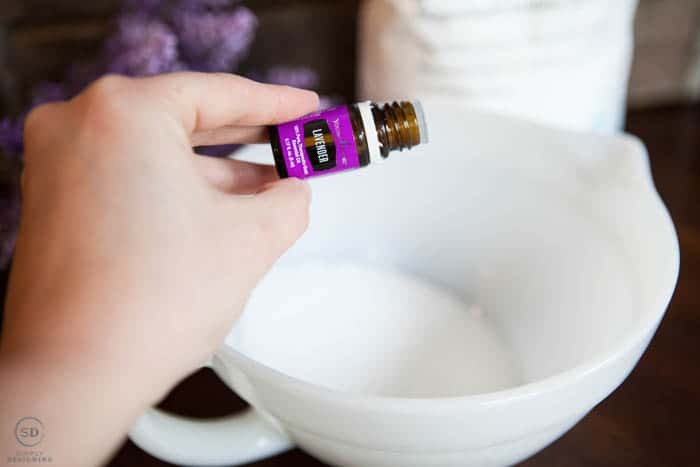 If you are in need of some relaxing (aren’t we all) detox baths are one of my favorite ways to relax and this recipe for Lavender Bath Salts is one of my favorite recipes I make! 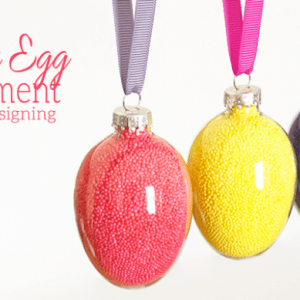 If you love bath bombs, you should check out my post on How to Make Bath Bombs. But bath salts can give you the same relaxing and detoxing benefits as bath bombs without as much work! Seriously! 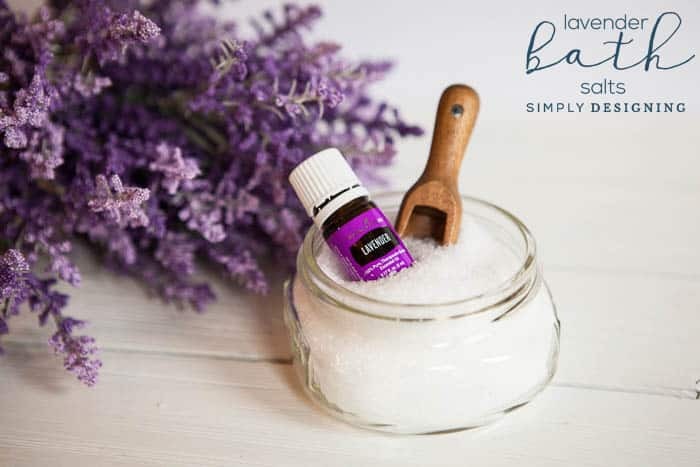 Lavender Bath Salts only take a few minutes to make, you can customize them in any way, and they are the perfect thing to add to a nice relaxing bath at the end of a long day #MeTime. 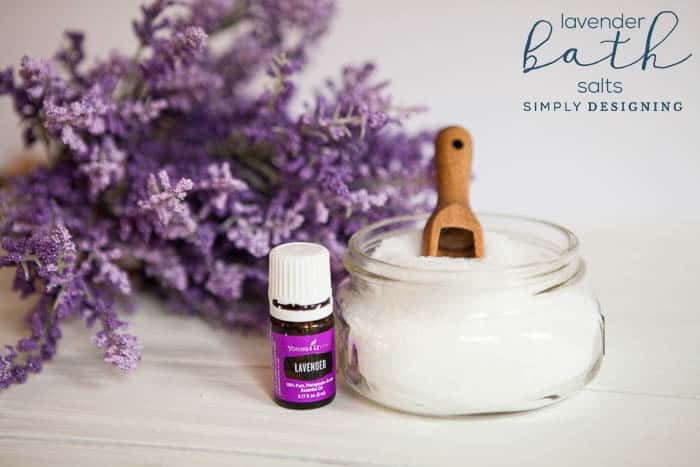 I also love love love giving bath salts as gifts, so keep reading for more information on bath salts and snag my recipe for these Lavender Bath Salts too! 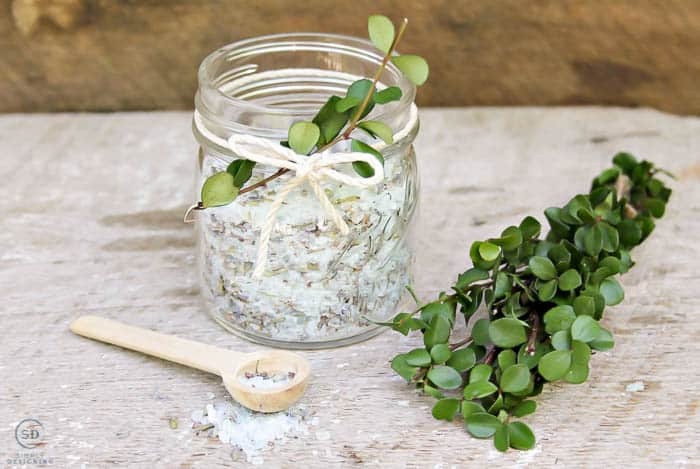 Why use Epsom Salts, Baking Soda and Essential Oils in Lavender Bath Salts? 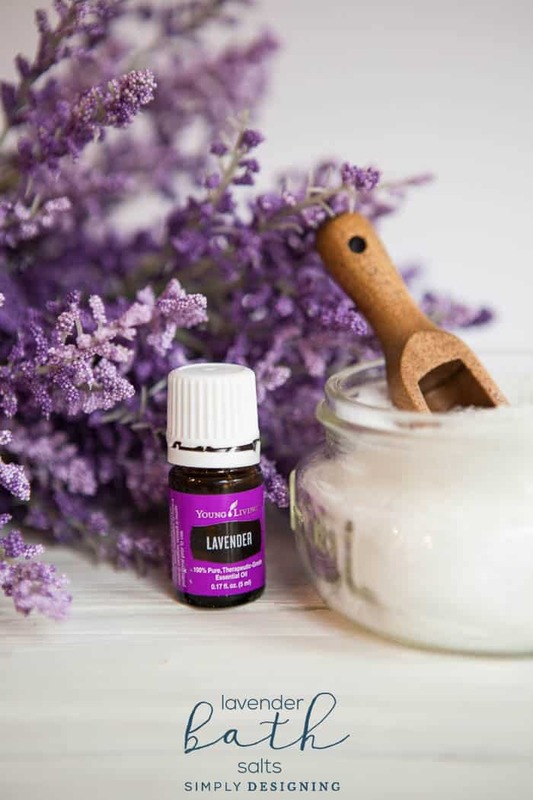 Lavender is incredibly relaxing and is a great essential oil to use at the end of the day to help you relax and unwind. It can help promote proper sleep patterns and help you to shake off the day so your mind and body can relax. Epsom salts are known for their ability to help your body detox. 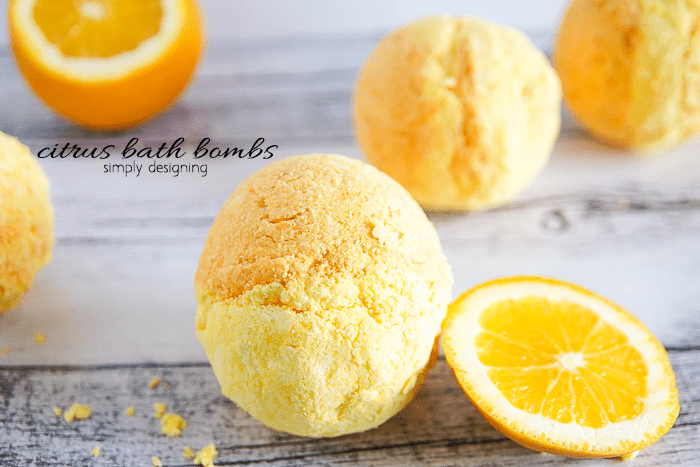 They are so amazing to add to a hot bath to help your body get rid of toxins. Epson salts are also really good for helping your body and muscles to relax. 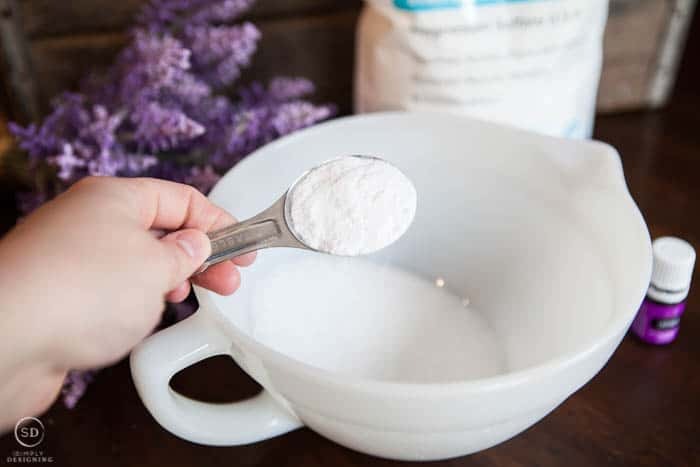 Baking Soda can also help your body get rid of toxins and it helps to leave your body soft and silky smooth. 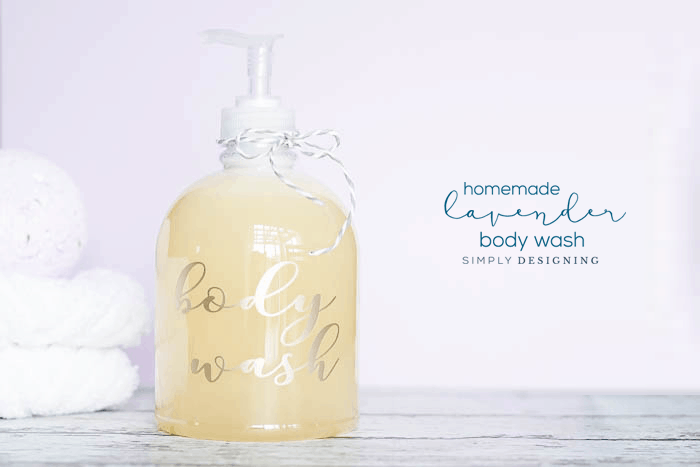 The combination of all three of these things makes for an incredibly relaxing, soothing and calming bath that will also help rid your body of toxins! It is the perfect combination to use right before bed. Why Should I Take a Detox Bath? You should take a detox bath because we live in a world where we are surrounded by toxins. 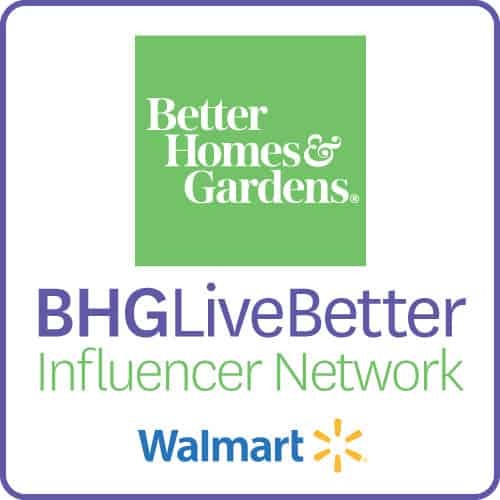 Our air is polluted, pesticides are used on our fresh fruits and vegetables, many processed foods we eat really aren’t that good for us and even the products we put on our skin often contain toxins and chemicals that get absorbed into our skin. Taking a detox bath will help your body in releasing those bad things from your body. How Often Should I Take a Detox Bath? I love to take a detox bath once a week. But you really can not do it too often! I know people who take detox baths once a day! 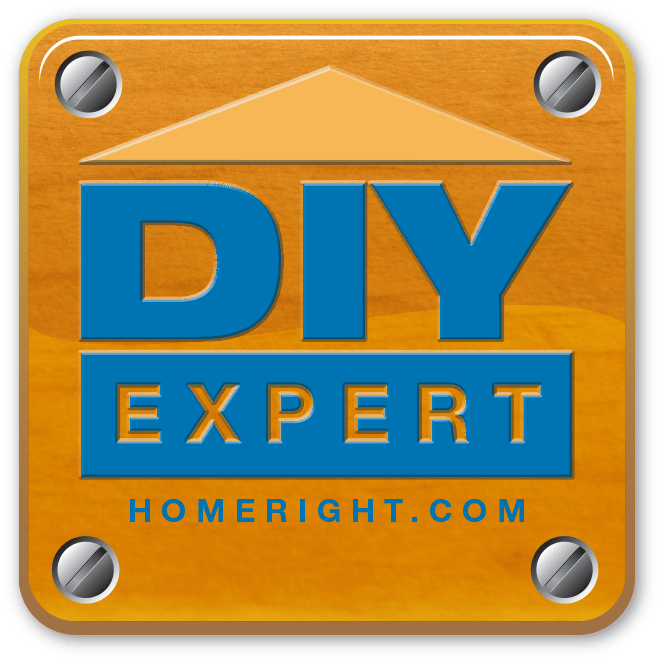 Just be careful as Epsom salts are not always recommended with certain health conditions and so you need to be sure that you are always getting the guidance of your doctor and if you have any adverse reactions, to stop and figure out what is going on. And always be sure to get out of the tub slowly while holding onto something as you might feel a bit dizzy. How Do I Take a Detox Bath? You will want to begin by drawing a bath with water as hot as you can stand it! 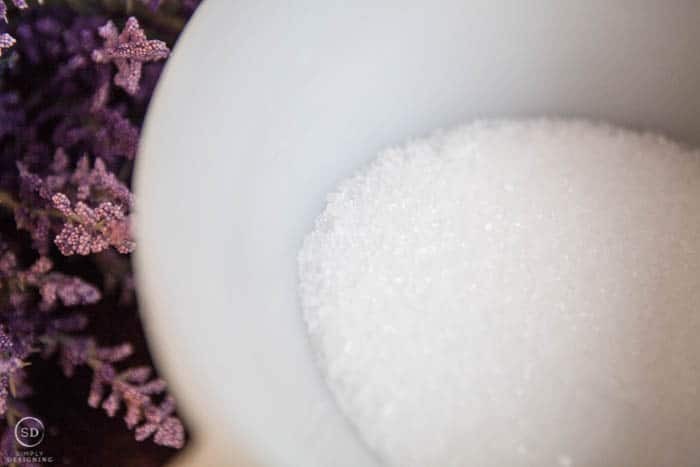 While the tub is filling up, add your favorite bath salt mixture to the bath (you can use my recipe for Lavender Bath Salts below) and let it dissolve. The submerge as much of your body as you can in the hot bath for 20 minutes. When 20 minutes is up, slowly get out of the bath and hop into a cold shower. By hoping into a cold shower, you wash the toxins off your body and your pores will close up so the toxins that were released during your bath will not go back into your body. This will be a shock to your system though, so feel free to let the water warm back up so you feel warm and relaxed again before getting out of the shower. 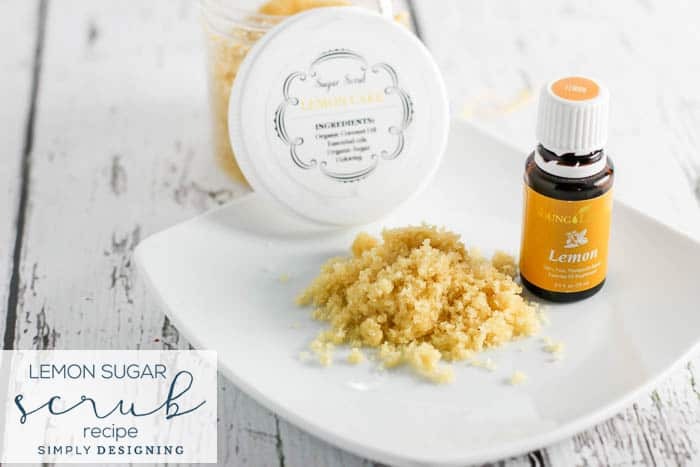 I used lavender essential oil for these bath salts, but I also love making these with Stress Away, Orange or so many more options of amazing essential oils that Young Living offers. 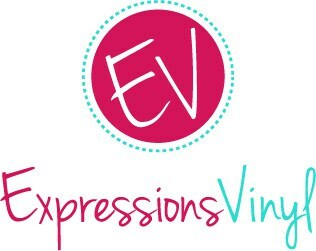 Really, there are so many good options for essential oils in bath salts! Are you ready for my lavender bath salt recipe? Ok, let’s go. 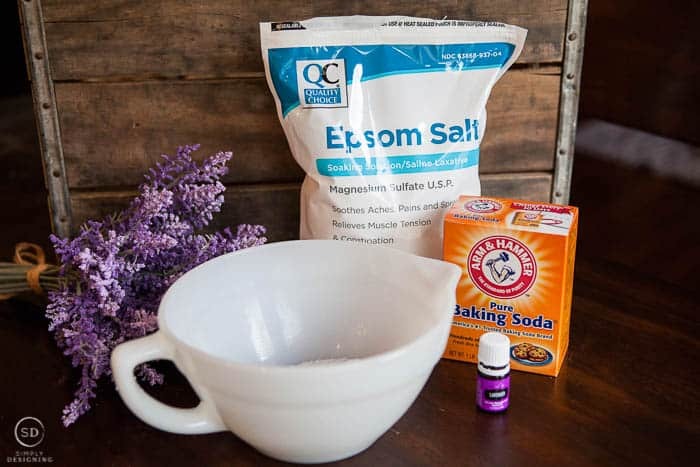 Combine Epsom Salt and Baking Soda in a glass bowl and stir. 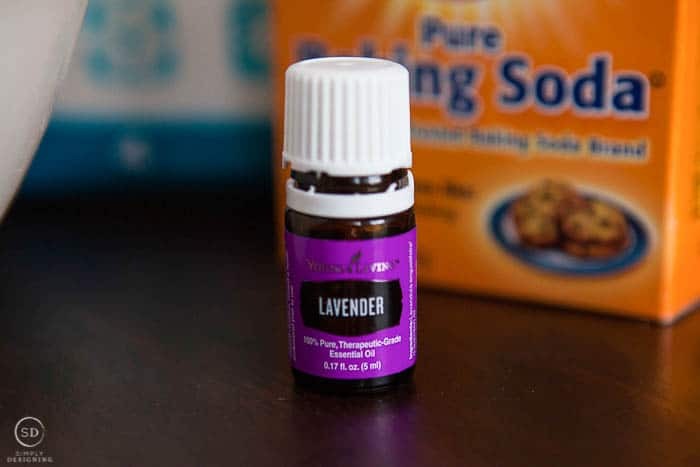 Add the Lavender Essential Oil and stir until thoroughly combined. 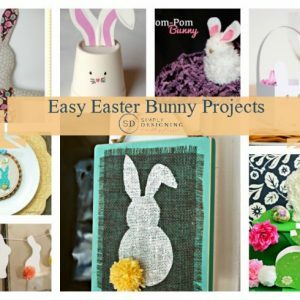 Store these in a glass container with a lid. Use 1/2 to 1 cup of this mixture in your bath. 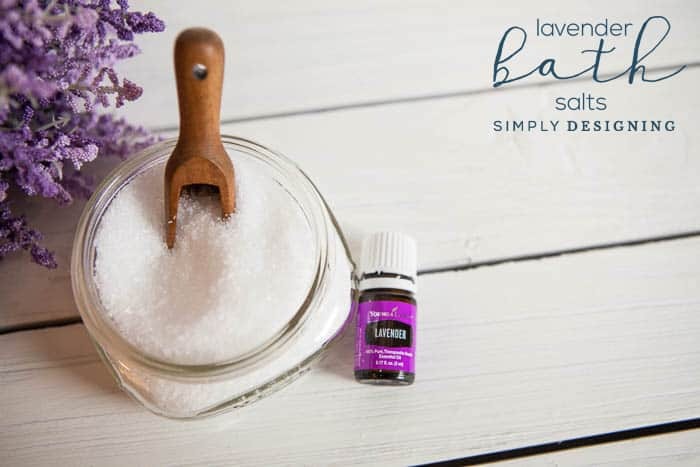 Bath Salts are really so simple to make and so inexpensive to make that it doesn’t even make sense to use store-bought bath salts ever again! 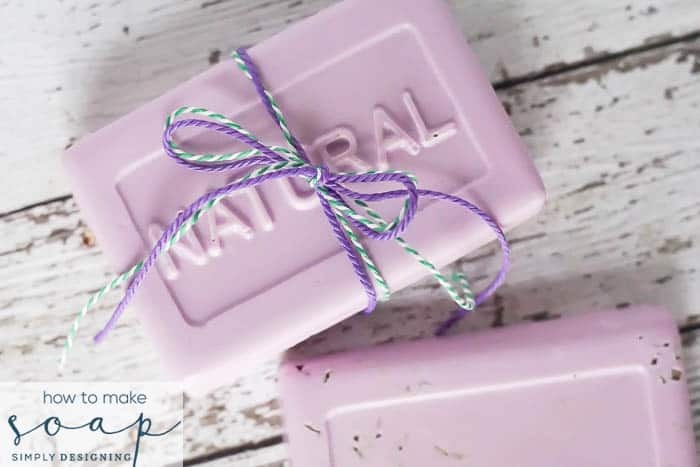 Plus by making my own I know exactly what ingredients are in is so I can be sure that I am only using things I trust in my bath!